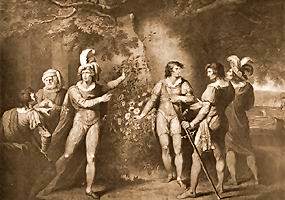 EARLS OF SOMERSET, SUFFOLK, AND WARWICK; RICHARD PLANTAGENET, VERNON, AND ANOTHER LAWYER. Painted by Josiah Boydell. Engraved by John Ogborne.